The BFI London Film Festival is one of the most prestigious events in the movie calendar. Over recent years, the festival has hosted the British premieres of some of the most acclaimed animated features around, and this year is looking to see this continue. Nora Twomey's new feature The Breadwinner (which has been written about extensively on this site) will receive its UK premiere. This follows in the tradition of distributor StudioCanal debuting major animated films at LFF, following last year's The Red Turtle and in past years When Marnie Was There and Song of The Sea. 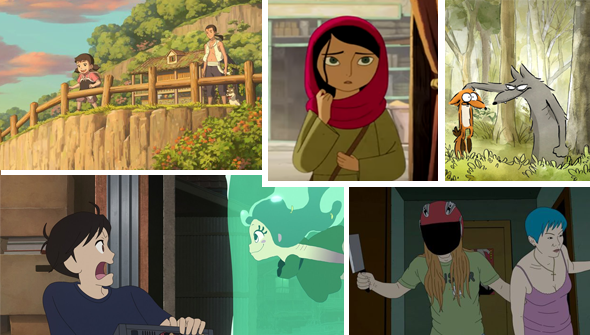 Cartoon Saloon's film will be the only animated feature to screen in competition this year. Outside the competition, StudioCanal are also bringing the UK premiere of The Big Bad Fox And Other Tales to the festival's Family Strand. The Family strand also features Lu Over The Wall, one of Masaaki Yuasa's two animated features of 2017. Featuring a young man who encounters a lively mermaid in a "funky, upbeat tale", it's screening at the festival ahead of its December cinema release from Anime Limited. The latest film from France's Michel Ocelot (Tales Of The Night) Ivan Tsarevitch and the Changing Princess will also be screening. Manga Entertainment are taking a step into the world of Chinese animation, with the gorgeous looking 2D animated fantasy feature Big Fish and Begonia, described as "Spirited Away meets The Little Mermaid". Also from China- but a world away from Big Fish- is Liu Jian's gangster thriller Have A Nice Day, screening as part of the Festival's Dare strand. French-Japanese adult feature Mutafukaz will be also screening as part of the same strand. Finally, there is the intriguing sounding Liyana, a "documentary and animated fiction hybrid", that brings to life a story created by a group of orphans in Swaziland. And as usual, a program of animated shorts will also be screened as part of the LFF. This year's festival will run from October 4- 15. Tickets for most events will be available on general sale from September 14 from the website.